I am a fan in principle of the idea of smart beta funds. These funds eke out a bit of extra return by moving beyond capitalization weighted indexes. Many of these funds use some sort of alternate factor to weigh their exposures such as dividends, growth or value. I have discussed some pluses and minuses of specific funds at ETF.com here and here. However, I wanted to make readers aware of a bit of academic research which we have been reading lately which makes me want to be a bit cautious when using factors. The first is by Duke professor Campbell Harvey (who I heard speak at the Society for Quantitative Analysts last week) and Texas A&M’s Yan Liu who argue in “And the cross section of stock returns…” most factors discovered are likely false. They contend that the advent of cheap computers and the strong pressure to find new ideas has led to so many factors being researched that, in effect, people have pronounced factors as statistically proven while, in fact, the relationship is just random. The details of this may have you looking back to your college statistics book but Professor Harvey motivated a recent talk with this XKCD cartoon. Harvey sees a few of the most important ideas such as value and momentum as significant, but many others such are earnings price ratio or small cap versus large cap are more suspect. Another interesting piece of research was published in by Rob Arnott and his colleagues at Research Affiliates titled “The surprising alpha from Malkiel’s monkey and upside down strategies“. These researchers find several potential smart beta strategies get a good deal of their returns from value and size tilts, even those which do not explicitly take value into account. Imagine a stock trading at a given price to book (PB) ratio. If a random shock moves the price of the stock up with no change in the book value, then the stock has a bigger place in the cap weighted portfolio and a smaller weight in any other portfolio. Should the price of the stock decline, the opposite holds. In some of my own research which informed the ETF.com notes, I found several smart beta indexes which do not have the value or size tilts so you can find them if you look. Arnott also finds that random portfolios outperform cap weighted portfolios, though I think it’s best to think of the random portfolios as noisy versions of equal weight portfolios, who also have tended to outperform cap weighted indexes and also show size and value exposures. A more challenging idea in the Arnott paper is that some inverse smart beta portfolios also outperform the market. That is instead of buying stocks that are cheap from a PB perspective, buy those which are expensive. For some thoughts against this notion see this presentation by Felix Glotz who fails to replicate the Arnott findings. I think both Harvey and Arnott would agree that it is important to make a deliberate decision about what sort of index you want to have and think carefully about what the economic sources of return are supposed to be when moving away from the default of capitulation weighted. I went to an interesting conference put on by the Society of Quantitative Analysts last week. The first speaker was Alessio de Longis of OppenheimerFunds, slides here. He made several interesting points, two of which I want to highlight. First, he dug into what happens in a global flight to quality episode where an increase in risk aversion causes a decline in stock prices, a rise in bond prices and a rise in the dollar. De Longis describes the safe haven dollar as a myth. He identified seven episodes since 1997 and examined capital flows over those episodes. What he found was no systematic relationship between foreign flows into the US, but rather a strong relationship between US flows and a crisis. Specifically, a tendency for US investors to reduce portfolio exposures in these periods and they speculate that this tendency is the source of the boost given the dollar in these episodes. The second interesting point from this presentation was describing the US as a whole as giant hedge fund. By which he means that if you take the international investment position of the US you see a big net long equity position (at about 19% of GDP) and a big short fixed income position (about 41% of GDP). De Longis is saying that like a hedge fund, that the US in aggregate is borrowing money from overseas and using (part of) the leverage to buy equities. Since net international positions have to sum to zero, it won’t surprise you to learn that most other countries’ fixed income and equity positions run the opposite position. When listening to the first part of the presentation I wondered if the authors have investigated if this pattern holds in other countries. Are asset shifts in Japan or the UK more associated with foreign or domestic flows? But after the description of the US dollar as the financing vehicle of global risk assets I am not sure that their idea should hold other places. He goes on to build an interesting single factor foreign currency trading system, but the idea I was most interested in was conceptual shift of looking for flight to quality macro flows as being primarily a function of US investors. This post was edited on May 26, 2015 to correct the size of the US net investment positions which should have been expressed in terms of US GDP not world GDP. Employment day is a good day to check in with the economy. Overall, we remain cautiously optimistic and hopeful for stronger growth in the second half. 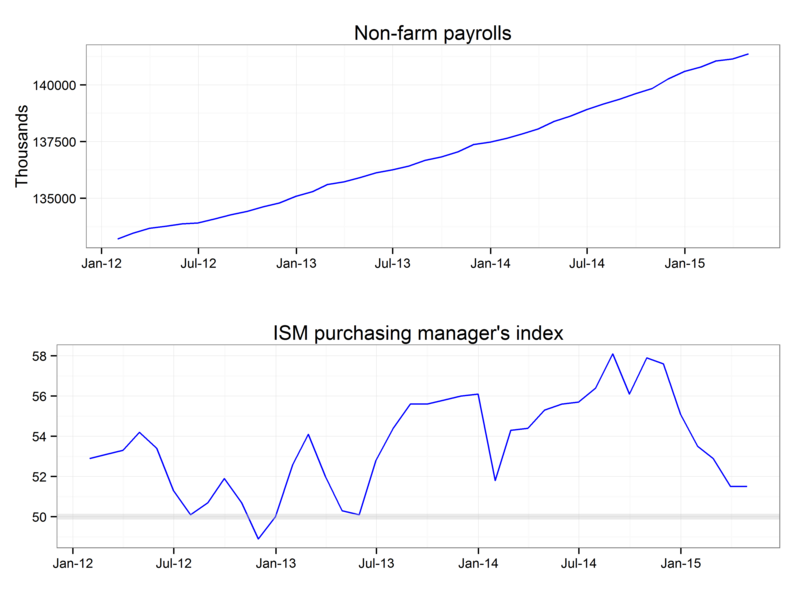 I feel that as long as people are still getting jobs, and the manufacturing activity as measured by the ISM survey continues to expand, we can hope for continued reasonably strong growth in the economy. We would need to see employment growth falter or sustained contraction in the manufacturing sector to begin to get nervous about the economy. 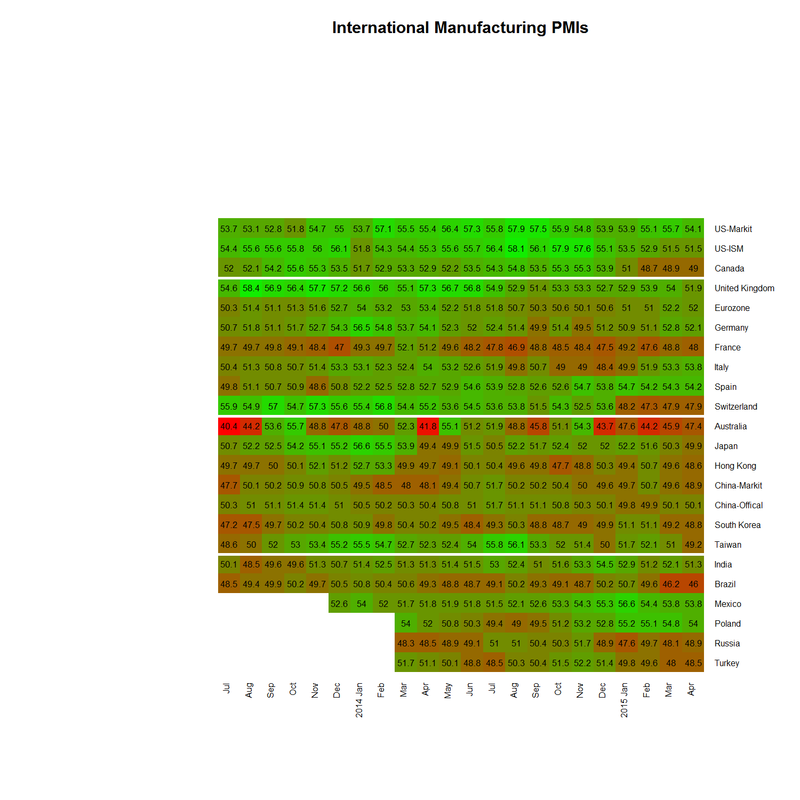 The global manufacturing environment continues to be a source of concern. 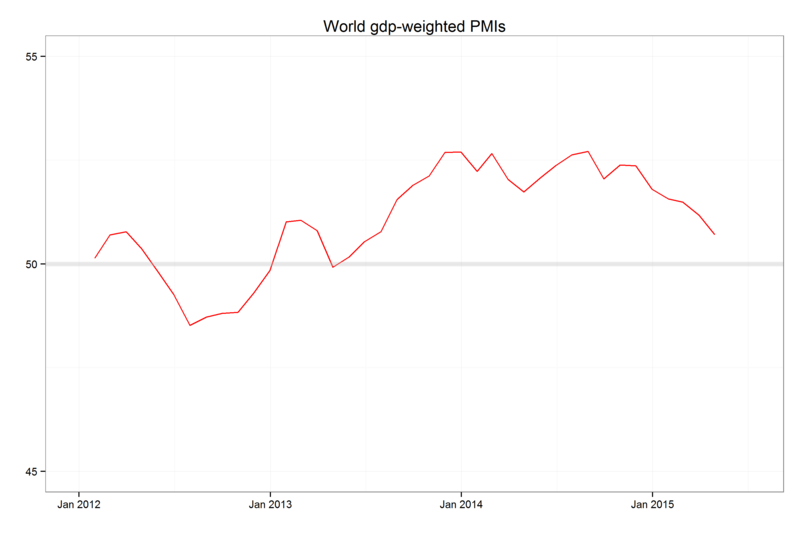 The chart below averages the PMIs of the g-20 group of countries, weighted by GDP. Despite noticeable improvement in Europe, this measure continues to decline dragged recently by China and to a lesser extent, Asia broadly. The heatmap below gives the details, click for a clearer view.